hey gang! i recently got a quadcopter which runs on lipo cells and the battery charger was lackluster to say the least, so i did a quick mod to allow me to charge using my nitecore, so far so good, but i don't really have any experience with lipo charging. I want to make sure this is ok as it is the beginning of what will be my most expensive laser project ever. FYI i want to put a class 1 laser array on the bottom of a quad/hex/oct?/deca/dodeca copter. just in the testing phase now and want to make sure i don't burn my face with battery juice! How many cells is the lipo? Because if it is more than 1 cell it needs a lipo balancer. 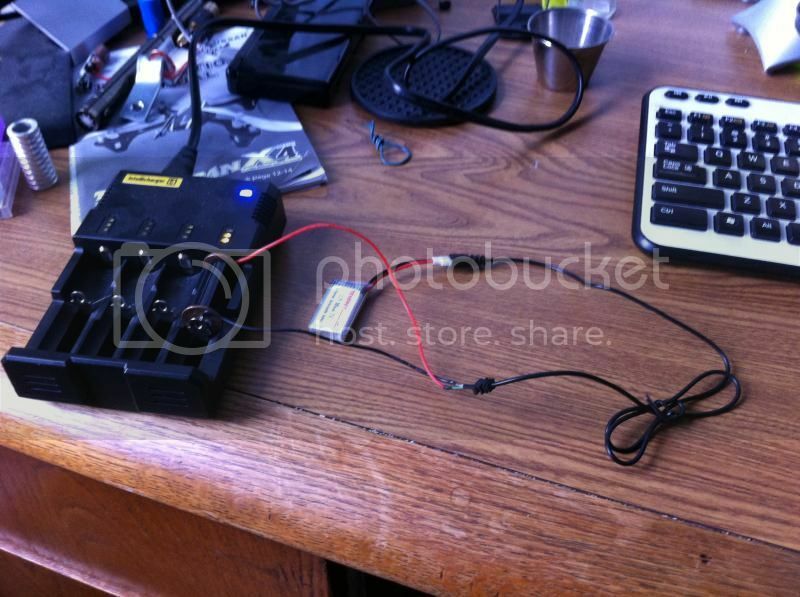 Regardless, use a proper lipo charger, for an rc car battery or something. I'm sure you've seen how unstable lipo batteries are if they are mishandled. If you didn't know, they burst into flames. It really isn't worth the safety risk, just buy a proper lipo charger. The ol' apple RAM slot technique eh? yeah the second i realized i was dealing with lipo batteries i was kinda like.... fudge it. i might just go the other way, and mod the copter with a 10440 battery holder, its the same weight with more mAh. bad idea? that way i can use a 2xAAA holder and use 1 lion for the copter and 1 for the laser array. Since the array will be so low powered i don't see the battery life being a huge issue. 10440 is probably not the best choice for this application. LiPo often has higher safe discharge rate compared to similar sized LiCo. typical 10440 has a capacity of ~300mAh. I wouldn't take these past 1A discharge. For a small lipo like yours, I would charge 2 at a time for 375 ma each.